Quiddity awarded T202660: Create a <gallery mode=slideshow> option that shows thumbnail strip by default a Love token. Quiddity edited projects for T221798: Design support request: infographic, added: CommRel-Design; removed acl*communityrelations_policy_admins. Quiddity added a comment to T221570: MassMessage failing with "to Special: was skipped because target was in a namespace that cannot be posted in". Huge thanks to Krinkle for fixing this. :-) Tech News has now been delivered. I've unset the priority, accordingly. Quiddity lowered the priority of T221570: MassMessage failing with "to Special: was skipped because target was in a namespace that cannot be posted in" from Unbreak Now! to Needs Triage. Quiddity added a comment to T58362: Allow users to create custom notifications onwiki. @ahmad Thanks for the use-case description. Quiddity updated the task description for T221622: Tech Talks Proposal July 10, 2019: Deployment Pipeline Overview. Elitre awarded T221570: MassMessage failing with "to Special: was skipped because target was in a namespace that cannot be posted in" a Like token. Quiddity updated subscribers of T221570: MassMessage failing with "to Special: was skipped because target was in a namespace that cannot be posted in". @Esanders Feedback needed please and thank you! Quiddity triaged T221570: MassMessage failing with "to Special: was skipped because target was in a namespace that cannot be posted in" as Unbreak Now! priority. Quiddity created T221570: MassMessage failing with "to Special: was skipped because target was in a namespace that cannot be posted in". Quiddity removed a project from T220926: Deprecate and remove mw.config wgMainPageTitle: User-notice. removing tag, per previous comment. Quiddity updated the task description for T221119: Translate error - unable to save translations on metawiki in one page just marked for translation. Quiddity added a comment to T221119: Translate error - unable to save translations on metawiki in one page just marked for translation. In my opinion this issue is high priority but not UBN!. Semi-confirmed in another page, at https://meta.wikimedia.org/w/index.php?title=Special:Translate&group=page-User%3AQuiddity+%28WMF%29%2Fsandboxtranslation&language=en-ca&task=view&filter=%21translated&action=translate - It let me translate the old pre-existing text, but gave the same error on a newly added line. Quiddity created T221119: Translate error - unable to save translations on metawiki in one page just marked for translation. Quiddity moved T220272: Adoption request for Templatetransclusioncheck from Incoming to Abandoned tool policy (adoption & usurpation) on the Toolforge-standards-committee board. Quiddity added a comment to T217435: Changing /wiki/Security and wiki/MediaWiki security reference content. @Quiddity @CKoerner_WMF does any of you own this? Quiddity added a comment to T220641: Change ownership of wikimania-program@lists.wikimedia.org. Hello, how would I add emails to this list? Quiddity awarded T198628: Count the number of video plays a Like token. Quiddity reassigned T220641: Change ownership of wikimania-program@lists.wikimedia.org from Dzahn to fgiunchedi. Quiddity moved T215922: Community input for patrol log reviews in 'all public logs' from Backlog to Started on the CommRel-Specialists-Support (Apr-Jun-2019) board. Quiddity moved T218634: Request for support publishing Medium-term Plan in April 2019 from Backlog to Started on the CommRel-Specialists-Support (Apr-Jun-2019) board. Quiddity changed the status of T202929: Assure that documentation about communities and engagement processes is relevant and up to date from Open to Stalled. Quiddity edited projects for T215922: Community input for patrol log reviews in 'all public logs' , added: CommRel-Specialists-Support (Apr-Jun-2019); removed CommRel-Specialists-Support (Jan-Mar-2019). Quiddity edited projects for T199084: Archive or update Technical Collaboration pages in Meta and Office Wiki, added: CommRel-Specialists-Support (Apr-Jun-2019); removed CommRel-Specialists-Support (Jan-Mar-2019). Quiddity edited projects for T218634: Request for support publishing Medium-term Plan in April 2019, added: CommRel-Specialists-Support (Apr-Jun-2019); removed CommRel-Specialists-Support (Jan-Mar-2019). Quiddity triaged T220212: Wikimedia Technical Conference 2019: Discussion as Normal priority. Quiddity updated the task description for T220021: Update TCG-related content. Quiddity added a comment to T214238: Add es-ES Language to Wikidata. We have es-419 for Latin American Spanish already. Quiddity added a comment to T133109: Add basic abuse prevention to UrlShortener. But I'm not sure if there's more details that show up for the stewards themselves in https://en.wikipedia.beta.wmflabs.org/wiki/Special:ManageShortUrls (which we obviously cannot see), or if it's mentioned anywhere onwiki yet. Thanks! Quiddity updated the task description for T150918: Add "Previous page" link to additional results pages at Special:PrefixIndex. Quiddity reopened T150918: Add "Previous page" link to additional results pages at Special:PrefixIndex as "Open". Quiddity edited Description on Community-Relations. Quiddity triaged T218634: Request for support publishing Medium-term Plan in April 2019 as High priority. Quiddity updated the task description for T219290: Wikimedia/Wikimania Hackathons Design Help. Quiddity renamed T219290: Wikimedia/Wikimania Hackathons Design Help from Wikimedia/Wikimania Hacakthons Design Help to Wikimedia/Wikimania Hackathons Design Help. Quiddity added a comment to T219007: Allow Portal namespace on Wikitech. What specific task(s) are you wanting to achieve, that having a new formal namespace would help with? Examples would help! Quiddity added a comment to T218634: Request for support publishing Medium-term Plan in April 2019. If yes, I can do that. If it's something more complicated, then I'd appreciate example-links or clues about what kind of formatting you mean. Thanks! Quiddity added a comment to T18691: RFC: Section headings should have a clickable anchor. Thanks! Do you happen to still have the underlying database query and could post it here so we could re-run it? Quiddity awarded T150153: Enable substring searching on office wiki a Love token. [...] At first this idea was exciting, but as I started to mock it realized that it is perhaps awkward to have some actions ("Edit" and "Edit source") be persistent, and have "Share" be visible only on hover. Quiddity added a comment to T215922: Community input for patrol log reviews in 'all public logs' . @EvanProdromou Hi, Did you have any questions about the research and recommendations that I wrote about above? Thanks. Quiddity added a comment to P8179 MediaWiki:Lang subpages. Quiddity created P8179 MediaWiki:Lang subpages. Quiddity awarded T110727: Consolidate documentation for recommended color palette a Love token. Quiddity added a comment to T210926: Display mapframe for geocoordinate statements on client. Is there an example of it live in action? If yes, please add it to the task description (for easy visibility) and maybe also the Tech News items? Thanks! Quiddity changed the status of T217789: Snottywong/JackPotte tools.wmflabs.org scripts are broken and unmaintained from Stalled to Open. Quiddity edited projects for T217789: Snottywong/JackPotte tools.wmflabs.org scripts are broken and unmaintained, added: Toolforge-standards-committee (Maintainer needed); removed Toolforge-standards-committee. Quiddity moved T217789: Snottywong/JackPotte tools.wmflabs.org scripts are broken and unmaintained from Incoming to Abandoned tool policy (adoption & usurpation) on the Toolforge-standards-committee board. Quiddity changed the status of T217789: Snottywong/JackPotte tools.wmflabs.org scripts are broken and unmaintained from Open to Stalled. Struck earlier comment. My mistake, sorry for the noise. RhinosF1 was indeed seeking someone else to maintain it. Quiddity moved T217509: Adoption request for crosswatch from Incoming to Abandoned tool policy (adoption & usurpation) on the Toolforge-standards-committee board. Quiddity added a comment to T217509: Adoption request for crosswatch. Hi @OriHoch, I've updated the task description with the other required parts of the process. Please do replace those "LINK" items with the links once you've completed each of them. Then after 14 days change the status from 'stalled' back to 'open'. - This is to make completely sure that all methods have been tried for contacting the existing maintainer(s), and there's always a possibility that you can convince them to return to help you with a little bit of advice if you ask nicely! Thanks. Quiddity changed the status of T217509: Adoption request for crosswatch from Open to Stalled. I like the idea of the share button, even though it adds an extra click to a relatively simple action. However, what are we doing to address the earlier concern of placing more actions next to the Edit action, when Edit is the most important action on a wiki? Also, do we need to consider the mobile case as well (i.e. creating a solution for mobile browsing parallel to a desktop version)? Quiddity added a member for Wikimania-Hackathon-2019-Organization: Quiddity. 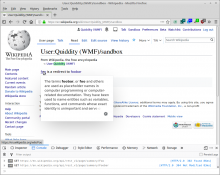 Quiddity added a watcher for Wikimania-Hackathon-2019-Organization: Quiddity. Quiddity added a member for Wikimania-Hackathon-2019: Quiddity. What if, it just updated the address bar in your browser (i.e. it went to anchored link) and you could copy it from there? Quiddity added a comment to T217378: Page Preview fails on redirected articles. That's what all the Wikimedia sites originally/previously used (from 2004–2013) but it was globally changed (in Vector) to be next to the headings in 2013. (after failed attempts to do so (?) in 2007 and 2009). See the detailed research that led to the 2013 change, linked at T96515#1219109 and T13270 and other links within those. One of the historical issues that plagued the right-floated links (when they were standard), was when they would "bunch up" under a tall navbox or a string of images. E.g. See the "April to June" heading here. There were complex docs on Help:How to fix bunched-up edit links! Personally I don't advocate for or against changing the current placement, but I love that I can override it easily. And the placement as a whole is complicated because of past history. Quiddity updated the task description for T211734: Help panel: develop a way to guide wikis on generating the right help content. Quiddity updated the task description for T202929: Assure that documentation about communities and engagement processes is relevant and up to date. Quiddity removed a watcher for Privacy: • ZhouZ. Quiddity updated the task description for T52092: Implement glossary (terminology) support. 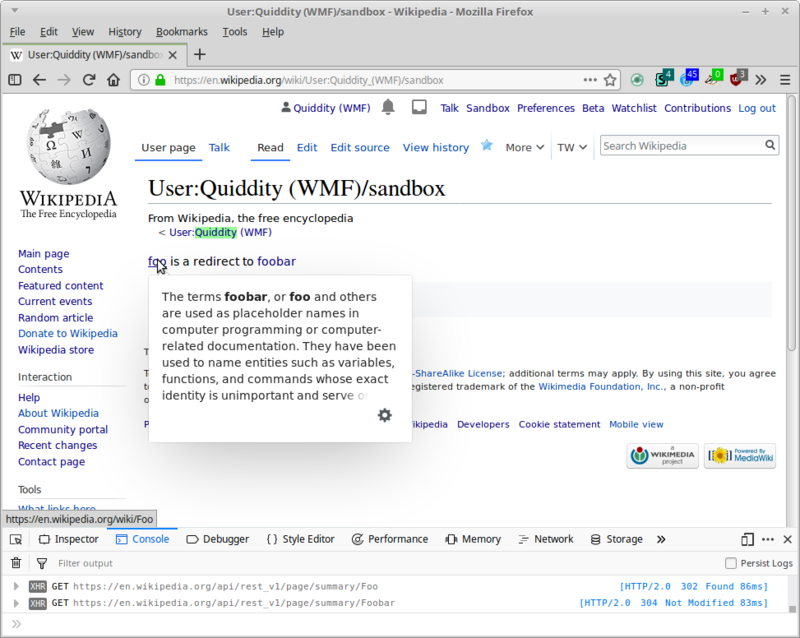 Quiddity updated the task description for T90263: Improve glossaries to better help Wikimedia editors understand technical terms. Quiddity updated the task description for T139380: MassMessage failed delivery claiming "readonly" although the page is not protected. Quiddity triaged T139380: MassMessage failed delivery claiming "readonly" although the page is not protected as High priority. When this bug occurs it is severely impacting the functionality of this tool and causing a lot of extra work for MassMessage senders. Triaging to 'high'. Quiddity awarded Blog Post: Perf Matters at Wikipedia 2015 a Love token. Quiddity added a comment to T197525: Let users sort results by time (older or newer results). Note: This is now possible to do in normal searches via tweaking the search URL, per work on T40403. I've mentioned it in the docs. It would be great to have (some? all?) of these Help:CirrusSearch#Explicit sort orders features added to the Advanced Search interface for easy access. Cheers! Quiddity added a comment to T40403: Sortable search results. Quiddity added a comment to T216126: Requesting contentadmin access for 'Lucas Werkmeister (WMDE)' on Wikitech. Quiddity added a comment to T215251: Ban recurrent spam to Wikimedia mailing lists (January 2019). All seems clear on the lists I subscribe to and admin. Thanks for the work here! Quiddity claimed T215922: Community input for patrol log reviews in 'all public logs' . I recommend that you just make this change on the wikis which do not use RCPatrol. Quiddity created T216214: Add Header for Wikidata Properties page's Sitelinks div to make it more accessible. Quiddity updated subscribers of T214721: Create #pageviews-anomaly tag. Quiddity updated the task description for T215046: RfC: Use Github login for mediawiki.org. CKoerner_WMF awarded T70689: User Preference's default options/values should be automatically marked in the special page itself a Love token. Quiddity created T215486: Shortcut interwiki links have wrong target at wikimaniawiki. Quiddity added a comment to T126487: Cursor gets "stuck" when down-arrowing from the start of a link which spans a page beginning/end. Quiddity added a comment to T214888: Developing the Wikimania Wiki. I've fixed some issues on the current Main Page, and requested Admin and Translation-admin mops on the Volunteer page so that I can help with related and other things. Quiddity updated subscribers of T40403: Sortable search results. In the API this is now partially working! Quiddity updated the task description for T40403: Sortable search results. Quiddity created P8054 Email spam example 3. Thanks for the patch! As mentioned in https://gerrit.wikimedia.org/r/488022 a reject rule is now in place based on this subject. Quiddity created P8053 Email spam example 2. Quiddity created P8052 Email spam example 1. Quiddity placed T215137: Trash up for grabs. Ivanhercaz awarded T197923: Organize existing PAWS documentation a Love token. Quiddity updated the task description for T212788: Use subphrase matching for autocomplete by default on specific sites. Quiddity awarded Blog Post: Magic Numbers a Orange Medal token. Quiddity triaged T214081: Make a magic, self-labeling feedback button as Low priority.